Hey! Good news to all the Garfield fans and followers as Guardian Malaysia jog memories with cartoonist Jim Davis’ iconic fat cat, which has been known for its hilarious daily adventures since its debut in 1978. I still remember the good old days. Now you can look forward to start collecting your stamps when you shop at Guardian to redeem your Garfield On-the-Go series of bags and luggage. The iconic cat Garfield not only brings back fond memories for many adults, it is also much-loved by teenagers and young children. Guardian’s Garfield On-the-Go series of bags and luggage is for everyone in the family, lighting up your journey wherever they go. All you need is to make a purchase of RM20 to receive one stamp. 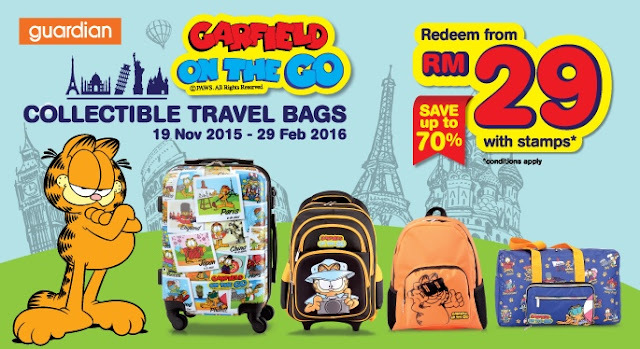 Once you have collected 20 stamps, you can redeem Garfield merchandises at discounted prices. You can also gain extra stamps by purchasing star-buy items. Stamps will be issued at all participating Guardian stores nationwide from 19 November 2015 to 29 February 2016 for Peninsular Malaysia and from 3 December 2015 to 29 February 2016 for East Malaysia. The Garfield On-the-Go programme was launched by Peter Dove, CEO of Guardian Health and Beauty Sdn Bhd at its annual dinner with trade partners on 18th November at Sunway Pyramid Convention Centre (SPCC). 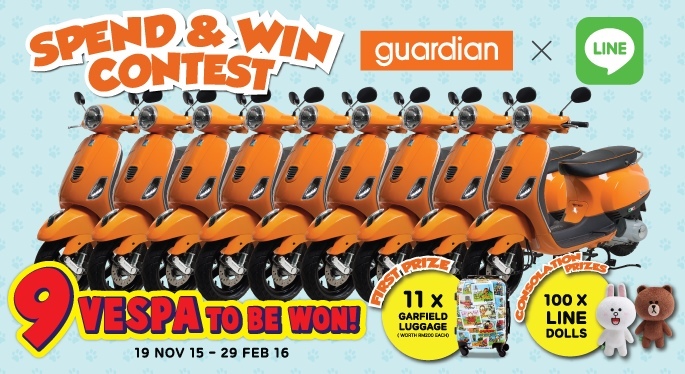 Kindly take note that redemption can be made from 19 November 2015 to 14 March 2016. By the way, you can also purchase a set of two multiple usage travel organiser for RM19, with every purchase of RM20.